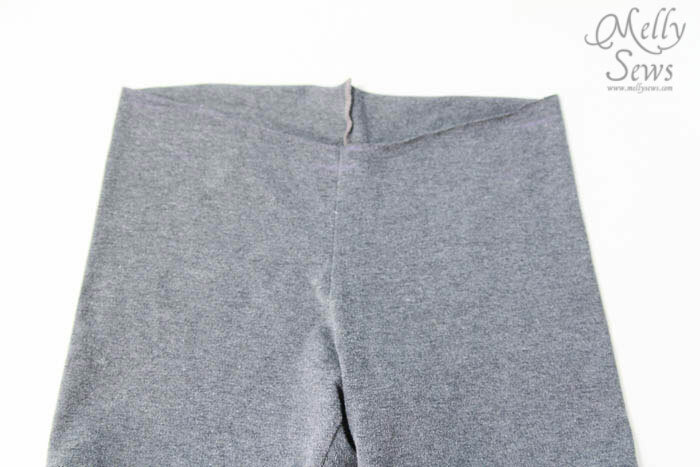 Do you have any of those ancient workout clothes in your closet that you don’t wear because they make you feel even fatter that you already feel? I have a LOT of those. 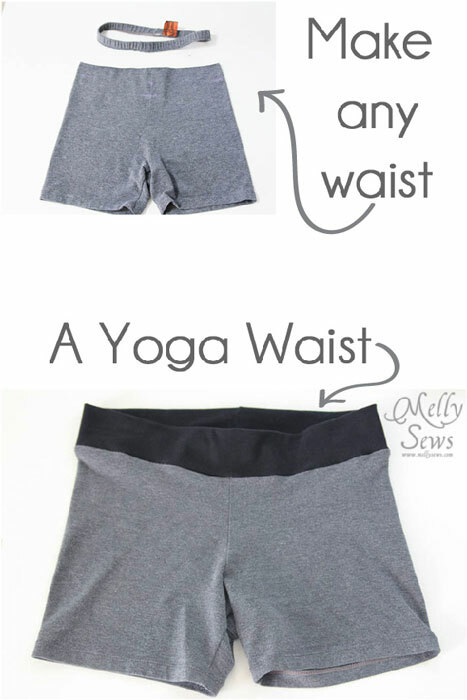 So today I’m sharing this yoga waistband tutorial. I’m not sure if it’s because some of my workout pants/shorts are so old, or because for some reason activewear manufacturers seem to think you want TIGHT elastic so those pants aren’t going anywhere. But I have workout pants I didn’t try before buying (gifts, a lot of the time) and I avoid them like the plague. Why do manufacturers do that? When this is so much more comfortable and flattering? I think I wore these shorts all of 2 times ever before I altered them. And I I got them YEARS ago. The unfortunate thing about the super tight elastic is that it does this. And yes this is a small picture on purpose. I can’t believe I’m even posting this on the internet. I mean who wants that kind of muffin top and other assorted lumps these give me, or pants that go up three inches past your belly button? I probably should have just thrown these away, but I thought they could be saved. And I was right, so hopefully this tutorial spares you muffin top and posting unflattering pictures of yourself on the internet. Start by cutting off the elastic squeeze of death. Using a pair of pants that you like for reference, or trying these on and marking where you would like the bottom of the waistband to sit, mark off the extra fabric. I cut my pants in a V in the front – I like the front of my pants/short to sit lower than the back. Cut, making sure you’ve left a seam allowance. 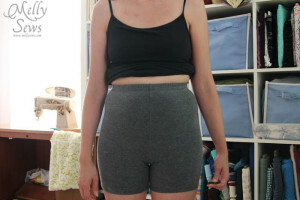 To figure out how long your waistband should be, measure where it’s going to sit on your waist and subtract 1.5″. Your waistband should be double the height of what you want your final waistband to be, plus seam allowances. Now fold your waistband wrong sides together, matching the long edges so you have a loop with the seam inside. 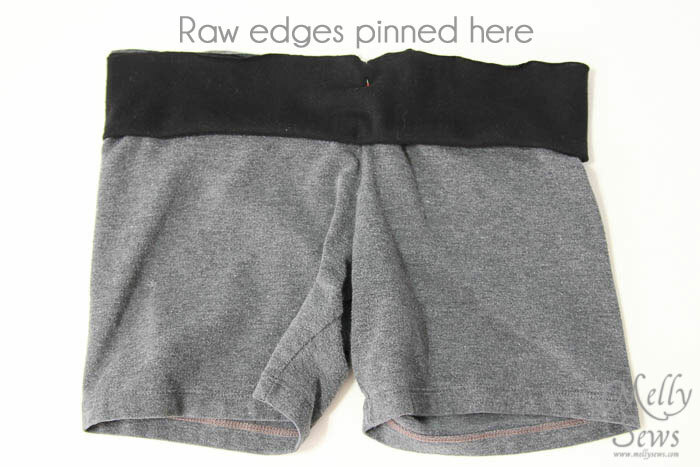 Put your waistband on the shorts or pants, right sides together, matching the raw edges (There are 3 raw edges – 2 from the waistband and 1 from the shorts). Match the seam of the waistband to the center back seam on the pants or shorts. Stitch, using a stretch stitch. Turn the waistband so the seam allowance points down, and you’re done. MUCH more flattering – no more weird lumps and bumps and now they sit below my belly button. So go on, rescue those pants you’ve been avoiding. It might even be an incentive to work out. I fell off the running wagon over the summer, despite all my New Year’s Word of the Year and all, but I’m climbing back on. I’ve made it to week 5 of the Couch to 5K program – yay! What about you – are your workout clothes a motivator or a reason to avoid exercise? Wow, I am actually wearing a pair of pants with the elastic squeeze of death right now… time to grab the scissors! I’m about to do the same to some gym pants too. But I have to take the tummy fullness out first. Fingers crossed, it all goes to plan. Thanks for the tute again. Thank you for this wonderful, simply tutorial! Thank you, too, for posting that tiny picture of the bad exercise shorts. I got a huge laugh at it because I have the exact same look going on when I don my old exercise pants. Thanks, I needed that today! 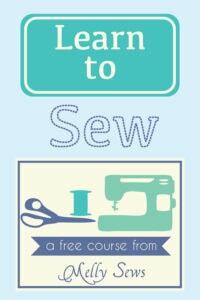 As a beginner sewer, I can’t tell how to sew something stretchy…any hints? I’d also like to add these waistbands to non-stretchy materials since I have never (even at 125lbs! -5’7″) had an indented waist…more of empire only. I cannot wear belts and always wear my waistband covered anyway, so all my jeans and trousers, chinos, etc should have these wonderful waists!! Kate, I can’t tell whether you got a reply to your question. I’ve been studying waistband makeovers, because I want to put a similar waistband on a pair of jeans. It’s not so much that they are too tight, but the denim waistband is uncomfortable on the sensitive skin on my tummy and waist. I bought a pair of cropped jeans for summer that have a soft waistband, and I’d like to add the same kind of waistband to my old jeans. Like you, I wear my shirts untucked. The non-knit pants need to fit your hips, which are probably a little bit larger than your waist. 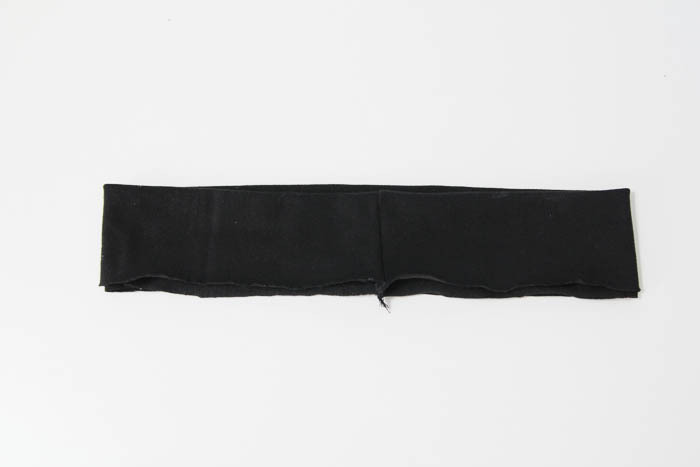 If the stretch band is made for your waist size, you’ll need to stretch it a little to match the non-stretch fabric of the pants: After you’ve made the “loop with the seam inside” (above), divide the waistband into four equal parts and mark the dividing points. Match the four marks to the center back, center front, and side seams of the pants and pin it. Stretch the waistband to fit and pin it in between the other pins. 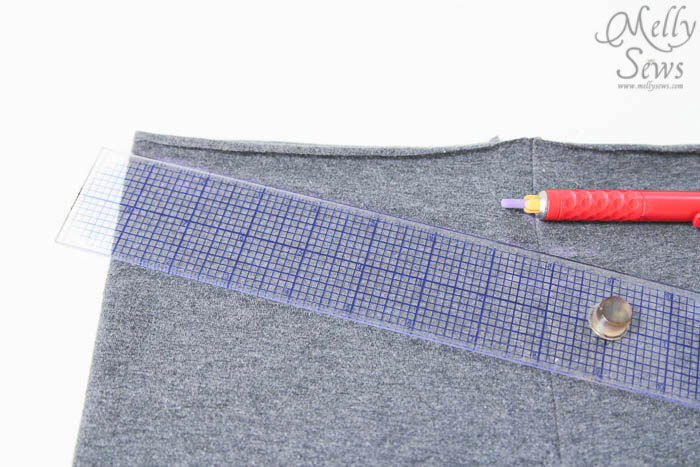 Then stitch as described above, using a knit stitch or a zig-zag stitch, stretching the knit waistband to fit as you sew. 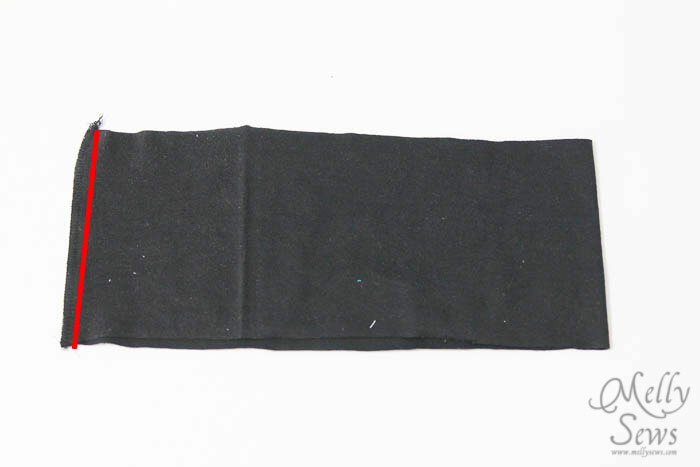 I think I’m going to put a loop of wide elastic (maybe pajama elastic) inside the knit waistband to reinforce it. Omg. Ya I have a bunch too haha this is awesome! I will definitely be doing this.. I will also be doing it to some skirts! Thanks for this brilliant idea! This is brilliant. 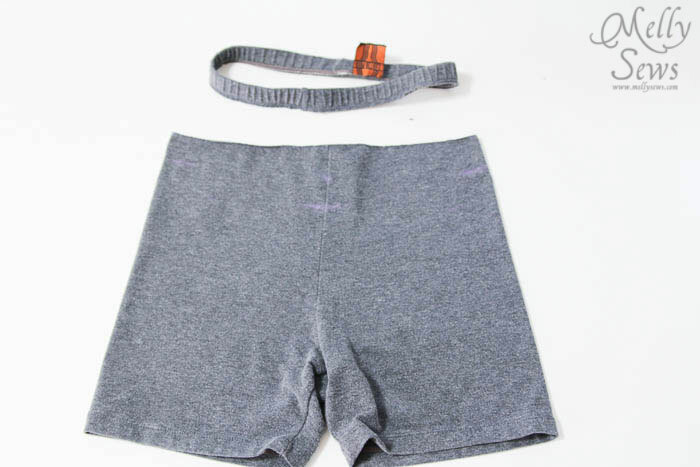 I have some short that the waist is way too high one me (I am shorter than average) this will make them much more comfortable. Thanks very much for posting this tutorial! Thank you so very much for this tute. I am trying to solve two problems. Mother Nature is rearranging my figure now that I am in my 60’s. I have no waist line anymore. Oh I’m still basically a size 8 things just don’t fit as well. Problem number 2 is my 4 year old granddaughter’s long waist. She is very slender and very tall. If it fits her she has exposed tummy and back well you know. This just might make the difference. I will try something tomorrow. Maybe start with pajamas for her and exercise pants for me. I can tell what your most popular post of 2015 will be!!!! THIS ONE!!! I think we are all high-fiving and saying “oh yeah! You squeeze of death everythings are gonna go! 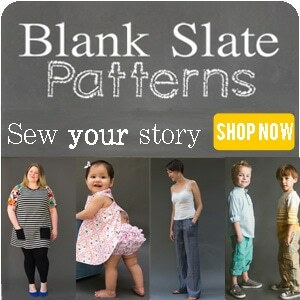 !” Kate, if you will check through older posts (try searching her blog for sewing knits) she has tips on sewing knits. You can do it!!!! You have to use a zig-zag. Can’t wait to hack up a bunch of stuff that I’ve been avoiding!!! @Rita McCart: it shouldn’t be too difficult, but you will need to sew up the fly and maybe remove the zipper. That’s how they make newer maternity jeans without the giant panel. Just be sure you cut the waist low enough so you can pull them up over your hips or only try this with really stretchy jeans. Pajama bottoms — sooooo much more comfortable now! Thank you Kelly. I want to do this to jeans. I’m a little late to your blog… I absolutely LOVE this tutorial. Thanks for sharing even though it is a couple of years old!! I love everything I have read on your blog. Please keep up the great instruction and projects. For me at least are valued and look forward to whatever comes next. Ahhhh-mazing! I’m going to do this to many a pant and short! Thanks for the idea and the tutorial.